The MCP401X devices are volatile, 6-bit (64 wiper steps) digital potentiometers with a simple up/down serial interface. The MCP401X devices offer a variety of configurations simplifying design while minimizing cost, package size and pin count. 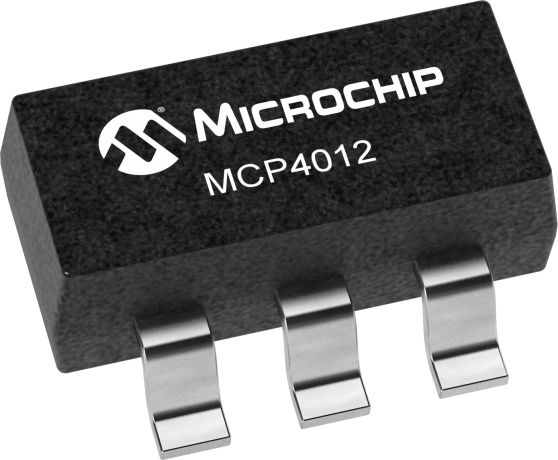 The MCP4011 device offers a voltage divider (potentiometer), with all terminals available on pins. The MCP4012 is a true rheostat, with both nodes of the resistor available on pins. The MCP4013 device offers a voltage divider (potentiometer), with one terminal connected to ground. The MCP4014 device is a rheostat mode device, with one terminal of the resistor connected to ground. The MCP401X family of devices are available with resistor values of 2.1kΩ, 5kΩ, 10kΩ and 50kΩ. These devices operate from a single 1.8V-5.5V supply and draw less than 1 µA while operating in the static state.